Today’s HR professionals need a balanced set of measures and processes to show the value of the HR contribution. Measuring the return on investment (ROI) is a promising tool to provide convincing data about the contribution of specific HR programs and processes. It is now a part of the measurement mix. It is, however, one of the most challenging and intriguing issues facing the HR field. The challenging aspect of the process is the nature and accuracy of its development. The process often seems confusing, inundated with models, formulas, and statistics that often frighten the most capable HR practitioners who joined human resources because they loved working with people, not numbers. Coupled with this concern are misunderstandings about the process and the gross misuse of ROI concepts in some organizations. These issues sometimes leave practitioners with a distaste for ROI. Unfortunately, ROI cannot be ignored. To admit to clients and senior managers that the impact of human resources cannot be measured is to admit that HR programs do not add value or that the HR department should not be held accountable for its impact — positive or negative — on the organization’s bottom line. In practice, ROI must be explored, considered, and ultimately implemented in almost every organization — whether it is for profit or nonprofit, public or private. 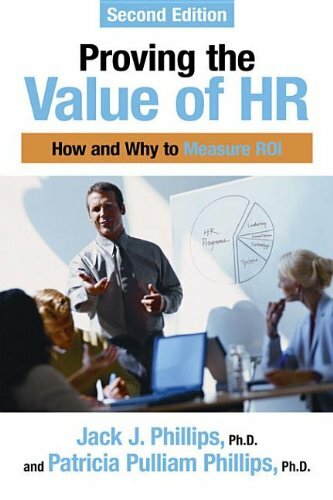 What was needed, according to HR practitioners, was a book that addresses the ROI process for human resources and presents an approach that is rational, feasible, and understandable to the typical HR practitioner. Proving the Value of HR is designed to meet that need. This book presents the ROI model in a step-by-step process. A chapter is devoted to each major part of the model as the pieces of the ROI puzzle are methodically assembled. At the conclusion, the reader has a clear understanding of the overall ROI process. The second edition has expanded and deepened its coverage of the three core areas of the book: (1) how to isolate the effects of an HR program from other influences, (2) how to convert data to money, and (3) how to monitor the impact data needed to show the value of human resources. The new edition has also been significantly reorganized and includes new information, examples, and a few new techniques. Appendix A. Self-Test: How Results-Based Are Your Human Resources Programs? Dr. Jack J. Phillips, a world-renowned expert on accountability, measurement, and evaluation, is chairman of the ROI Institute, Inc., the leading source of ROI competency building, implementation support, networking, and research. As the author and editor of more than 50 books, he conducts workshops and presents conferences throughout the world. Dr. Patti P. Phillips is President and CEO of the ROI Institute, Inc. She assists organizations with the implementation of the ROI Methodology in countries around the world. She is the author of several books, including The Bottomline on ROI, 2nd edition, which won the ISPI Award of Excellence; The Green Scorecard: Measuring the Return on Investment in Sustainability Initiatives; The Value of Learning; and Return on Investment in Meetings & Events.